career opportunities and corporate expectations”. The guest for the session was Ms. Ronita Ghosh who holds a Masters degree in Human resource Management from Symbiosis and has done BA -Economics (Honours) from Delhi University. She is an HR professional with over 12 years experience with organizations such as Pepsi, Genpact & Catalyst. The session began with the introduction of different functional areas which students shall be opting for as major specializations i.e. Human resources, Marketing, Finance and Operation. The speaker explained ways and procedures through which one can set goals and ultimately achieving them. She explained the various roles and profiles that are offered by corporate in these operational areas and the expectations from the new trainees. 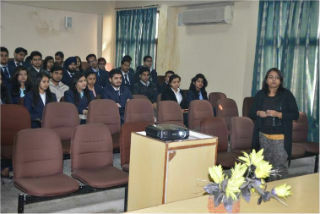 Ms. Ghosh also made the students aware of various challenges that candidates face in an organization. 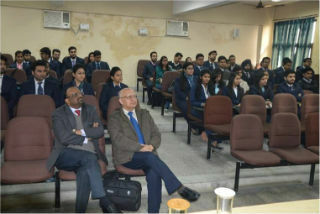 The session ended with Q&A round as students interacted thoroughly with the speaker and resolved their queries on various aspects related to functional specializations, scope and issues involved. Overall,the session was highly informative and provided immense learning to the freshers. Overall, the session was highly informative and provided immense learning to the freshers.